It is important to make sure that you and your family have financial protection in the event of unforeseen circumstances. We do not like to think about death or illness. However, what would your or your family’s financial circumstances look like if the main breadwinner were to suddenly die or suffer a major illness? It is a common misconception that the State will look after us from cradle to grave. The truth is, if you or your family become reliant on state benefits, you could end up living in poverty. It is always sensible to put actions in place which mean you are in control of your own finances and your own future, and are not reliant on hand-outs should something go wrong. We recommend to our working clients that they seriously think about committing a small amount of their income to protection policies such as life insurance, critical illness cover, income protection cover and even private medical care. Protecting you and your family is just as important as investing money for the future. Without protecting the family, there is no future. At Essential IFA, we can help you protect yourself against life changing situations by using family and income protection. There are lots of options available including Life Insurance and Critical Illness Cover as well as using our Will Writing and Lasting Power of Attorney services. Taking steps like this will make sure that your loved ones are protected as well as yourself. 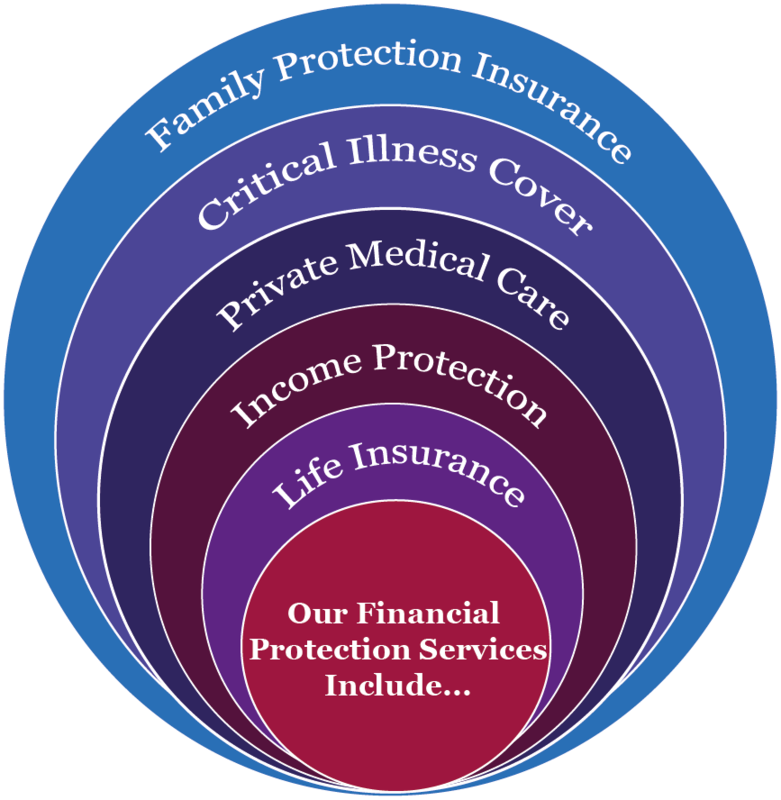 What is meant by Financial Protection Policies? There is a bewildering amount of different financial protection policies available on the market in the UK. It is important to design a protection solution that meets your individual needs as well as your budget. Life Insurance is a simple contract that provides either a lump sum or a regular income over a specific term. The contract can be written on either a joint or single life basis. This type of cover is usually used in the event of the death of a breadwinner, and will cover debts, or provide dependents with regular income. Critical Illness Cover pays out either a lump sum or regular income should you be diagnosed with a specific critical illness which has been pre-agreed from a list, and which occurs in a specific period of your life. You do not have to die from the illness to receive the payout. This type of policy can be useful for covering debts or providing short term cover for illness. Income Protection provides a replacement income should you be unable to work due to sickness or an accident. Typically, policies will cover up to 75% of your income after a specific period of not being able to work i.e. deferred period of one month, three months or six months. These policies will normally cover until you return back to work or retire. The above gives you an indication of the types of cover that can be taken out although it is not an exhaustive list. Your adviser will help to tailor a solution that meets your individual needs and budget as well as answering any questions you may have.